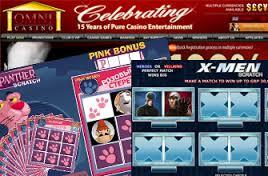 Scratch cards have always been popular and online casino players are not a different breed, which explains why the games are just as celebrated over the Internet. Omni Casino is powered by Playtech, so it comes as no surprise that the collection of new scratch games is based on their software. Those who are even remotely familiar with the recent lineup of games created by the software developer will know that this summer belongs to Marvel movie superheroes. The natural step forward was the release of scratch cards inspired by the same magical universe and the new title goes by the name of Spider-Man Attack of the Green Goblin Scratch. It is a fairly pompous name but those who take the time to discover it will find many interesting features. The best part is that there is no game in Omni Casino’s offer similar to this one, which makes it an excellent addition and players sould probably spend countless hours enjoying it. All the symbols are evolving around the Spiderman character, with goblins, the city of New York, the superhero’s girlfriend and radioactive spiders being also present in the game. The scratch cards are also intuitive and follow the common Playtech structures that makes the game so popular, so absolute beginners would have no problem in picking up the basics. Players are trying to find a winning symbol on one of the six cells of the scratch card and each sign has a different payout. Obviously, there is a link between the value of the scratch card and the potential payout, with the values ranging from 0.20 credits up to 100 credits. Those who wager the maximum amount can hope to win a prize worth 2000 credits, which makes the risk worth taking. This is the most popular new release that is already available at Omni Casino, but the online casino has another tempting proposition. Check it out at http://www.casinoadvisor.com/omni-casino-new-online-scratch-cards-news-item.html. It is called Avengers and this particular scratch card draws inspiration from the other immensely popular universe that players enjoyed on the big screen this summer. Several superheroes appear among the symbols, including Capt. America, the Hulk, Iron Man and Thor, but there is no shortage of villains. Regardless of what side they fight for, all these characters award generous payouts when discovered and the largest multiplier belongs to the Avengers logo which enhances profits 500 times.